My secret crazy weight loss. I was unsure about posting this as I know it's crazy and some may take this to the extreme. I've only told three people about what I've been doing because mainly I've been embarrassed. It's not your normal diet. Anyway, I researched it and once I seen the results I got it in my head and once something gets in my head I've got to do it. There are many concerns with this kind of diet and I'm sure a lot of you will disagree and think it's dangerous. But it's not if you do it sensibly and not to the extreme! I've been unhappy with my body since my first year at uni. But then when I met my boyfriend in my second year at uni I piled on the weight and I mean PILED on. I was two stone heavier and nobody said ANYTHING (I'm still fuming about that by the way, yes you Adam and the lasses!). So in the summer before third year I began dieting and lost some of the weight but still not back to my normal so I was glad to finish uni to stop eating crap and eat healthy. So eventually I lost weight by the fruit diet. I was eating fruit for breakfast dinner and have a salad for tea with some protein. It was a lush diet because I LOVE fruit and It works but be sensible with it. Luckily I had close people around me to tell me off when I was going over board and to fill me up which is good every now and then because it gets your body used to food so it works harder so when you go back on the diet it's working harder than normal. I'm no diet expert by the way and I tried every diet out there. I'm constantly on a diet if your like but I call it sensible eating. So this secret diet I've been doing is the CORSET diet. I wore a corset for 23 hours a day for 7days a week for a month. I wore it to bed and to work, everywhere. Which was rather strange knowing I was wearing this under my clothes. It was only a half corset so only covered the stomach so it didn't totally limit my movement. It was a bit of a struggle at work for a week or so trying to bend down etc but you get used to it. I wanted to try this diet because I wanted to shrink my ribs as you like. This sounds weird and extreme but my ribs stick out so much and I feel it would look so much better if they were smaller. After wearing the corset it has shrunk my ribs and it hasn't harmed them. The thing I have noticed that's it had an effect on is toning! Yeah I done toning exercises before but not enough to make a difference. So when I took this off to go on holiday I was LOVING the difference. It gave me definition and toned me. I ate the same as I normally would but since you're wearing a corset it limits the amount of food you want to eat so it stops you before you eat too much as you literally feel like you're going to POP open. I bought a cheap corset off and ebay shop and it was only £12 or something. You're meant to get a size 4 inches smaller than your waist size. I haven't put it back on because I need a smaller one now as I've shrunk to the size of the corset. I'm going to have a rest for a couple of weeks and start it again before my next holiday. Here is a before and after. 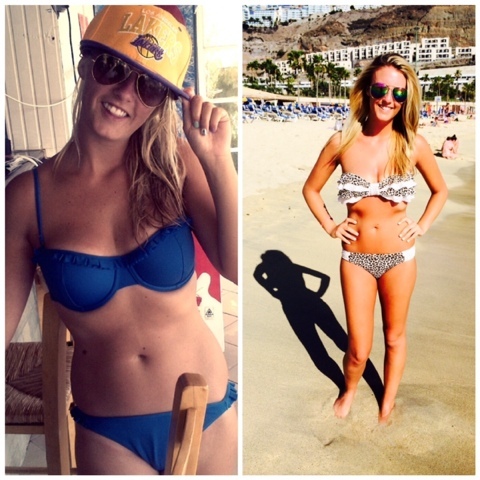 The first pic is last year on holiday and the second pic is me after the corset diet. If you're going to do this then please be sensible and don't go over board as there are many risks such as movement of the organs! Read up about it and do it correctly. Also Holly off Geordie shore spoke about this diet in a mag so read her story too. Before I get lots of comments about its mad, I know..but it worked and I was sensible about it. Just seen your Instagram post! So happy to read a decent review about this always wanted to do it but most reviews highlight that dangers rather than actually how to use it!! Can't wait to get one now and eBay too! Brilliant!! !